Francium formerly known as eka-caesium and actinium K, is a chemical element that has the symbol Fr and atomic number 87. It has the lowest known electronegativity of all known elements, and is the second rarest naturally occurring element (after astatine). Francium is a highly radioactive metal that decays into astatine, radium, and radon. As an alkali metal, it has one valence electron. Francium was discovered by Marguerite Perey in France (from which the element takes its name) in 1939. It was the last element discovered in nature, rather than synthesized. 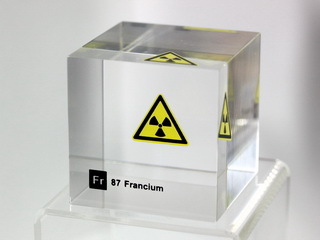 Outside the laboratory, francium is extremely rare, with trace amounts found in uranium and thorium ores, where the isotope francium-223 continually forms and decays. As little as 30 g (one ounce) exists at any given time throughout the Earth's crust; the other isotopes are entirely synthetic. The largest amount ever collected of any isotope was a cluster of 10,000 atoms (of francium-210) created as an ultracold gas at Stony Brook in 1997.